Mom Knows Best : Are You Getting A Good Night Sleep? We all know sleep is important as lack of sleep can affect your health and lifestyle. It is not just the amount of sleep that you get every night that matters, but also the type of sleep. A person can be in bed for 7- 8 hours, but still feel tired the next day as they are not getting the right type of sleep. A healthy person needs to get the proper amount of REM and Deep sleep to be able to function the next day. I suffer from sleep issues and have a hard time falling asleep every night. I also tend to wake up frequently throughout the night. I think I only get a good sleep about twice a week. I have tried almost everything to get a good sleep. The only thing I have not tried is sleeping pills and I won't because of drug sensitivities. So when Rem-Fit asked me to try out their REM-FIT ACTIVE 200 SLEEP & ACTIVITY TRACKER along with one of their Rest pillows, I said "yes" as I wanted to solve my sleep issues. I knew the first part of solving my sleep problem was to first monitor my sleep. Monitoring my sleep with an activity tracker would then allow me to see the quality of my sleep. The tracker would help me to see how much REM and Deep sleep I was getting. It would also show my light sleep and how many hours I was asleep. I was excited to know this info as then it might help me to find ways to improve my sleep. 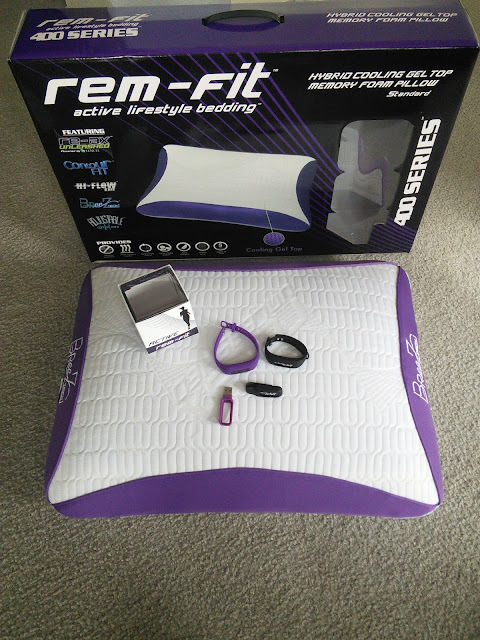 When my Rem-Fit 400 series pillow arrived with my Rem-Fit 200 sleep and activity tracker, I immediately opened the boxes and read the instructions. The tracker needed to be charged, so I placed the tracker into the charging base and then into my computer. While that was charging, I downloaded the app on my android tablet ( works with iPhone too) and registered my tracker. The process was simple and I loved that I was able to customize my tracker for not only my sleep but for my active activity too. This tracker could not only track my sleep, but also things like my steps, distance, calories, and more. The tracker would then take all my data and assign me points to help me track my progress. If I want to put the data into charts or share it friends, I could do that also. I was amazed at what this tracker could do. I love that I can wear the tracker on my wrist or waist with the included bands and clips. Once my tracker was fully charged, I placed in the purple wrist band, my favorite color. If you don't like purple, the set also has a black wrist band. Since it was almost bed time, I decided to track my sleep first with the tracker. It was easy to turn on the sleep mode with the start button on the app that was now on my tablet. 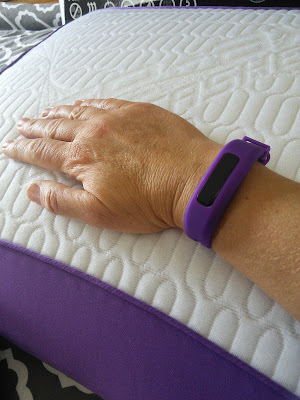 I pressed the start button and laid down on my Rem-Fit 400 series pillow. My new pillow was quite comfy and had a lot of cool features in it's memory foam. 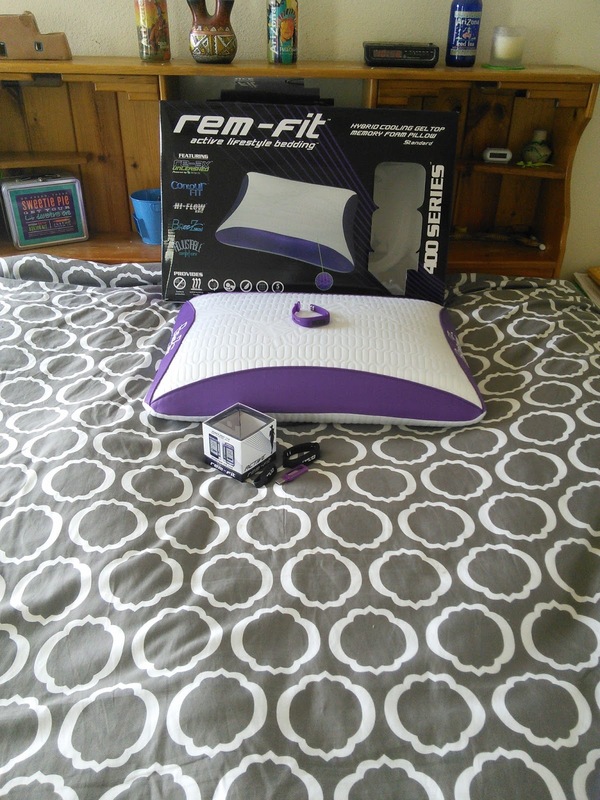 The memory foam allowed me to sleep on my side, which is needed due to sleep apnea problems. Back and stomach sleepers can enjoy this pillow too. I loved that this pillow could help regulate my body temperature as I sleep. Did you know that the proper body temperature can help you sleep better? 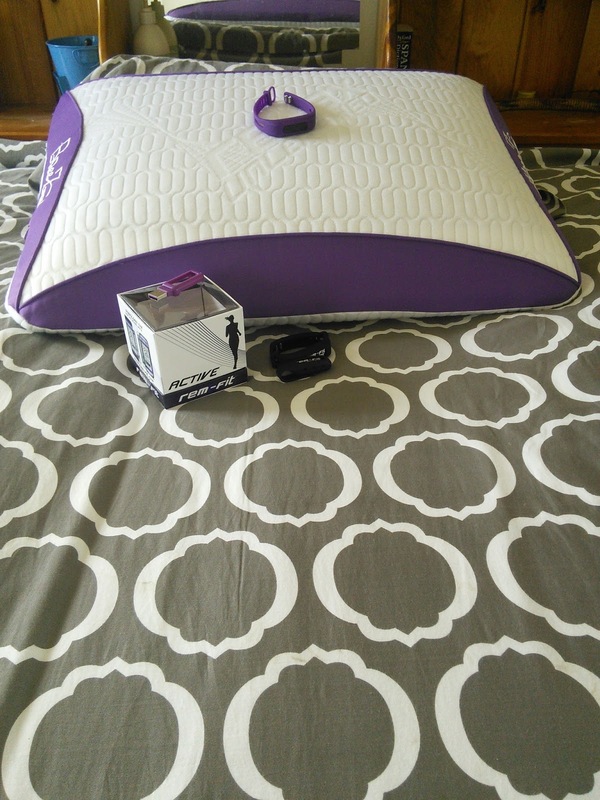 Check out the below list for all the pillows features. Re-Ax Fiber™ - This unique fiber reacts to one's body during sleep and provides active moisture and heat transfer allowing for a cool sleep surface. Contour Fit™ - The unique 4-way stretch creates an invisible and undetectable environment that contours to not only the sleeper, but also the sleep surface, allowing for free range of motion during sleep. Hi-Flow Knit™ - This unique knitting style allows for optimal air flow between the sleeper and the sleep surface, allowing for a cooler sleep environment while adding a layer of comfort. Breez Tech™ - Allows for the best hot and cool air transfer. Allows the hot air to flow away from the sleeper and cool air to travel towards the sleeper. Also allows for the pillow to breathe efficiently, extending the life of one's pillow. Polyfil Fiber - This easily accessible innovative core, allows one to decide the right level of personalized support needed during sleep. Simply remove or add the incredibly soft micro-fill to find the ultimate comfort level. REM-Fit's patent pending Support Clusters offer an incredibly soft, yet supportive inner filing, aiding the sleeper in getting the most restful nights sleep possible. This easily accessible innovative core, allows one to decide the right level of personalized support needed during sleep. Simply remove or add the incredibly soft Support Clusters to find the ultimate comfort level. 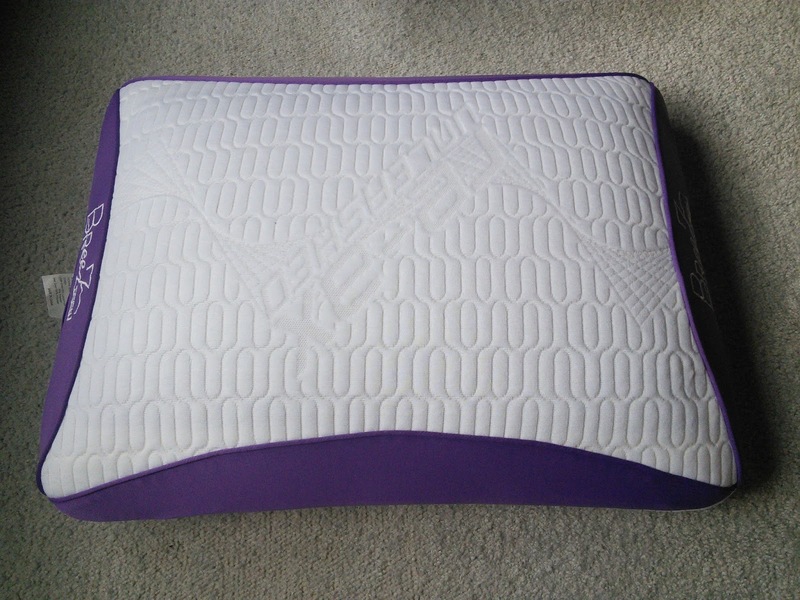 By removing some of the filing, the pillow can be adjusted to exactly the right balance of height and firmness or softness to suit individual sleep preferences. Cooling Gel Top - Get a wonderful night's rest with this gel top memory foam pillow. The gel pad disperses heat, offering a cooling sensation and is all wrapped up in a luxuriously soft keeping you comfortable all night long. So it was me, my pillow and my tracker and off to sleep we went. I could not wait for morning to view my sleep activity. I awoke the next morning from a rough night. The tracker had a alarm feature that vibrated the tracker to wake me up. That night as usual, I woke up several times through the night. I checked the sleep graph on my Rem-Fit app to see how I slept. The sleep graph showed that I got plenty of sleep but not enough REM sleep. A adult sleep should have 20% REM sleep and I only had less than 10%. I will track my sleep for a week to see if my REM is better on other nights. While I am using the tracker to help with my sleep problems, I love that I can use it also to make sure I get enough activity during the day. Not getting enough exercise during the day can also lead to sleep problems as well as too much caffeine consumption. I also have to stop drinking caffeinated drinks ten hours before bed or that will affect my sleep. I find that a snack of protein and carbs helps me to sleep better. Some people say a warm bath helps with sleep too. I am hoping with regular use of the REM-FIT ACTIVE 200 SLEEP & ACTIVITY TRACKER that I will be able to solve my sleep problems. 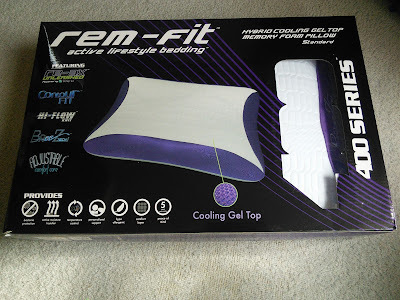 I know that the Rem-Fit 400 series pillow will help my sleep as it is so comfy. Once I lay my head upon it, it just feels wonderful. I have coupon code for 20% off . Use code TP20 to save 20% at the above website. "These opinions are my own and I received the above mentioned products to facilitate my review." Does this really work? there are so many gadgets out there for just about everything. I have an APP on my phone that analyzes my sleep - it's pretty cool! I wanna try this though now, I always find my sleep patterns fascinating... I think I am sleeping well, but in reality, I am not at all! I don't get near enough sleep and this pillow looks fantastic. I love that it moderates your body temperature when you are sleeping. Love this pillow! Plus the sleep and activity trackers sounds amazing, I know I could use some help with both! I'll totally be checking this out. I'm always so bus around the holidays that I'm to stressed to sleep properly. Thanks for sharing Tara. That's an interesting way to track sleep. I bet it would tell me I move to much. Wow, this tracker sounds really cool. I know I don't get enough sleep, and I also have trouble falling asleep. I also need just the right pillow so I don't wake up with a sore neck and headache. I'll check this out. I totally want to check this out because I always wonder how I sleep after I wake up feeling tired and sore! This is the first time I've heard of this and I think it's really awesome. It would be nice to have if you have issues with sleeping at night. The best part would be the cooling. I really like it pretty cold at night! This looks super relaxing it would be nice to have one! Thanks for sharing, this would really be a lot of help! I have a good night sleep most nights. This looks like a very nice/helpful pillow though. This is amazing, I need this. I have sleep problems, too and probably don't get enough REM sleep. I need to get 2 of these, one for my hubby, also. He would love it! I never sleep well because I have so many pain issues. I can't remember the last time I slept through the night. I want this pillow. I always had a hard time to sleep. This pillow is awesome. I'm going to check this out and see. looks so cool I'll have to tell my mom about it. This looks like a great product. Sometimes I don't sleep well, and being able to track my sleep to see if there's a pattern would be helpful. This looks so interesting! I have a MisFit that tracks my sleep but I wonder if this is more accurate? I'm going to need to check it out! I have horrific sleep issues - lov my tracker and the pillow would be awesome! Air mattresses come in as many varieties as you can find in traditional beds and water beds. You will find an air mattress with multiple layers of foam; they may have digital remotes, duo or single chambers and more. This can be a totally overwhelming experience. Sleeping is one of the most important commodities that we have to get enough of. When I wake up with neck pain I know that it is usually because its definitely starts with the wrong pillow. Having the right pillow to avoid neck pain is a vital necessity for getting a good night’s sleep. I completely agree with you ! If you want to remain more comfortable try a this pillow . Who you have mention Lowell the above post. I think it is better for you.